A multi-day battery life keeps insights coming day and night (varies with use and other factors). Get the nudge you need to move if you’ve been sitting too long. Choose from 15+ exercise modes, set goals and get real-time stats. Access everyday apps like weather in a tap—right from your wrist. See your stats any time of day with a display that adjusts to lighting conditions. Use Fitbit Pay™ to make easy, secure payments on the go (special editions only). Personalize your Charge 3 with unique clock faces that fit your style. Made with aerospace-grade aluminum, a smooth-flush case and Corning® Gorilla® Glass 3. Know your body and understand your health so you can take action to improve yourself. Exercises like running, swimming and more are automatically recognized and recorded for you with SmartTrack™. Charge 3 is water resistant up to 50 metres so you can track time spent in the pool or wear it in the shower. 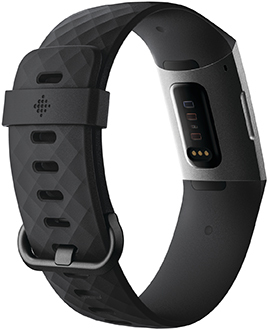 Charge 3 uses Fitbit’s most advanced heart rate sensors and algorithms to uncover meaningful insights on your heart. Better understand the impact of your workout with real-time heart rate zones that show whether you’re in the Fat Burn, Cardio or Peak zone. Know how many calories you’re burning all day and during workouts. Use what you learn to stay on track toward your goals. Connect Charge 3 with your phone GPS to see pace and distance on screen during outdoor runs and rides. Use those stats to keep improving. See how long you’re in light, deep and REM sleep stages. Then, learn how to get better rest with personalized insights. Use Charge 3 with the Fitbit app to track periods, record symptoms and estimate ovulation and fertility windows. 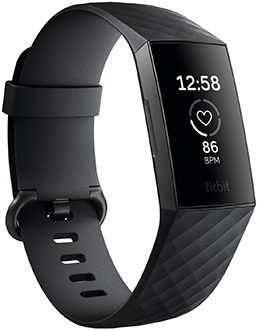 See the features that make this fitness tracker so advanced.